Workers at Toyota’s engine plant in Huntsville, one of the company’s largest, may yet find an Alabama companion in a much sought-after Toyota-Mazda assembly plant. What a gift it will be, for some lucky state, but the winner apparently won’t be Tennessee, Indiana, Illinois or Nebraska. The location for the new $1.6 billion automotive plant being birthed by Toyota and Mazda, billed to provide 4, 000 workers with high-paying jobs, was still undisclosed at press time but insiders suggested it was down to two states. Alabama and North Carolina are both considered strong contenders. State officials in Arkansas conceded it was out of the running, perhaps because of shortcomings in that state’s labor force training. “It’s too early to tell, but I suspect it will likely be one of the factors, ” Arkansas Economic Development Commission Executive Director Mike Preston told several media outlets. Indiana, meanwhile, had a different version of the same problem, with several auto factories already being on line there. Toyota officials were said to be worried that its two Indiana plants might lose manufacturing veterans to the new site. 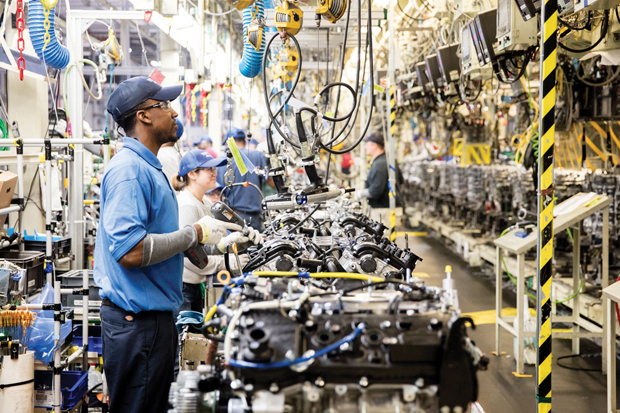 Alabama has one Toyota engine plant, which produces one-third of all American-built Toyota engines. Alabama workforce officials have been beating the drum for years on the value of workforce training. Big companies want workers who know the fundamentals of manufacturing on their first day. The big decision is due in early 2018. Whichever state wins the bonanza will need to bring its checkbook. According to Bloomberg, Toyota and Mazda are looking for incentives of at least $1 billion to score the factory.